We now have 25 members within L165 Cluster One who have results at the 67 markers level. The possible relationship between the various surnames within the cluster came be illustrated via a Fluxus diagram. I am still playing about with this software so the charts below should only be viewed as a ‘work in progress’. The length of vector lines represent distance from the modal for the group. The diagram does not take into account mutations which appear to be personal to an individual. If you click on an image it will open in a larger format. 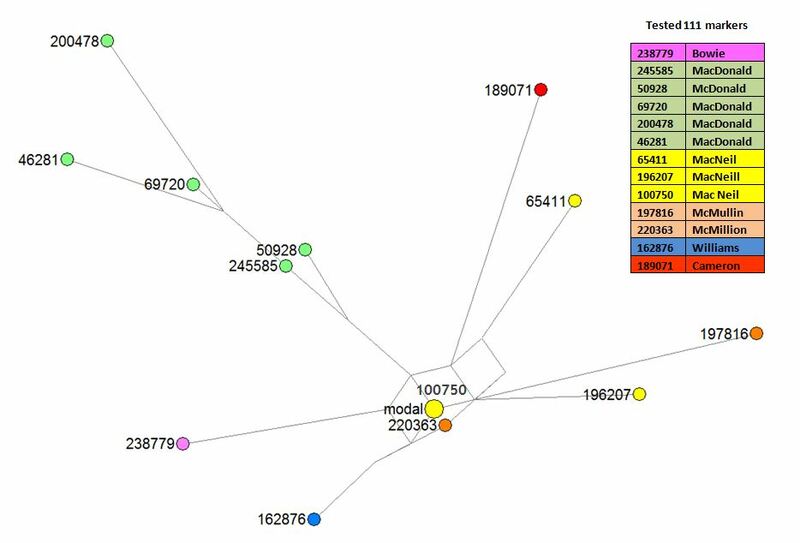 We now also have 13 members who have tested out to 111 markers at Family Tree DNA. The relationship between the various surnames within the cluster can be illustrated via a Fluxus diagram. 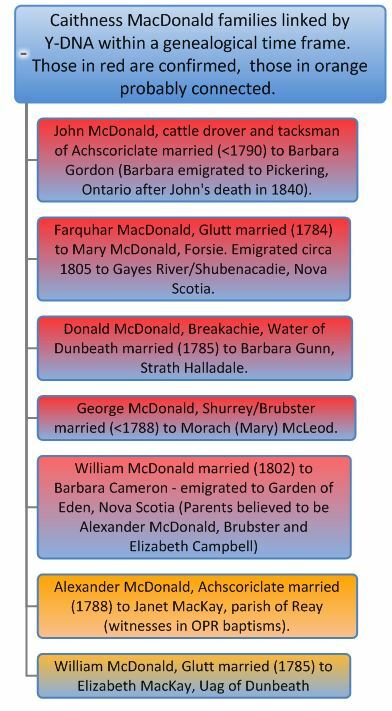 Our Caithness group of MacDonalds has grown with the addition of a descendant of William McDonald and Barbara Cameron who were married at Brawlbin in 1802. We have two distinct lineages within the group, both have connections with the Brubster area. 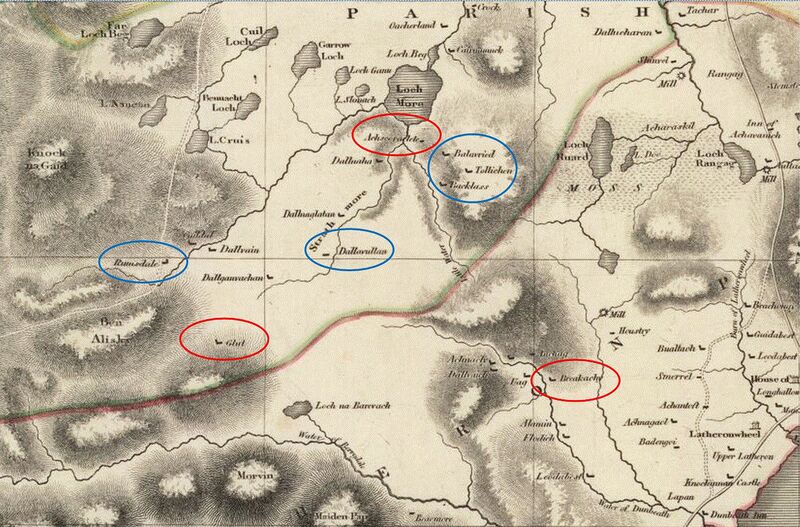 Families then spread out to Shurrery, Brawlbin, Glutt, Achscoriclate and over into the Strath of Dunbeath. The maps below show the primary location of our MacDonald families (red circles) in the parishes of Reay, Halkirk and Latheron. Circles in blue relate to families still to be connected or where ancestors of our group have lived. If you click on one of the images below, it will open in a new window to enable viewing of the place names. 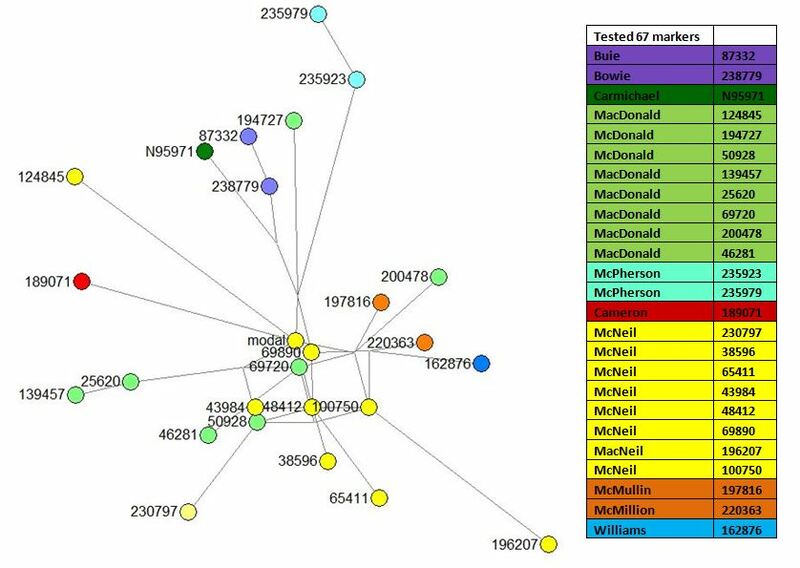 Since I first started this blog a lot has happened in the world of Y-DNA studies and a terminal SNP has been found for the Olive subgroup of the Clan Donald Project. 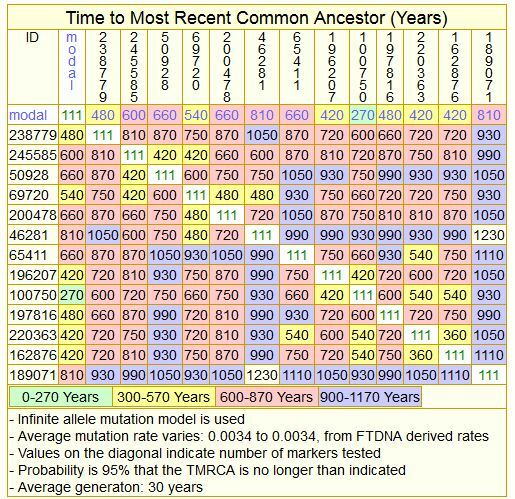 A new project at Family Tree DNA has been set up specifically for this marker called L165 which belongs to haplogroup R1b1a2. Therefore I will be editing and posting on this site to reflex these changes not least the title of the blog which is now Cluster One: R-L165 Project. Cluster One now contains participants with the following surnames: Buie/Bowie, Cameron, Carmichael, MacDonald, MacNeil, McMillion/McMullan and McPherson. I’ll be posting some information on how each is related to one another along with geographical information as and when I have time. Lori MacLeod Wilkes admin of the L165 Project maintains fantastic pages on the results – Cluster One can be found here. I am also now Scottish representative for Family Tree DNA in Scotland which has certainly opened my eyes to just how useful Y-DNA is becoming in genealogical research.